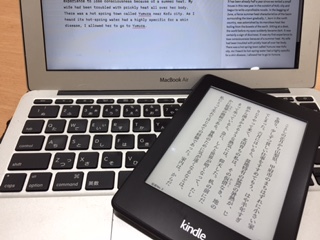 It has been already half a year since we rented a small house in this new year in the outskirt of Kofu city and begun to write unprofitable novels. In the begging of June, a fierce summer heat characteristics of the basin surrounding the town gradually, I , born in the north country, was astonished by its merciless heat like boiling from the bowels of the earth. Sitting at a desk, the world before my eyes suddenly became dark. It was certainly a sign of dizziness. It was my first experience to lose consciousness because of a summer heat. My wife had been troubled with prickly heat all over her body. There was a hot spring town called Yumura near Kofu city. As I heard its hot-spring water had a highly specific for a skin disease, I allowed her to go to Yumura.